Some books are hard to get into but are eventually worth the struggle, others make my eyes glaze over almost from the opening pages and bring about an irresistible urge to fall asleep, but just sometimes you hit the jackpot and pick up a book which engages and delights you from the opening paragraph and you find yourself totally captivated and nodding in agreement with the author’s comments as well as totally identifying with everything that he says. Apologies for the radio silence over the past couple of days but I have just been indulging myself and was totally engrossed in a wonderful new book mysteriously and enigmatically titled Gus Honeybun, Your Boys Took One Hell Of A Beating by Simon Carter. So what on earth is this all about and who or what is Gus Honeybun? Quite simply, Simon Carter is a journalist who has enjoyed a love affair with Exeter City for the past thirty-seven years and the book is almost four hundred pages worth of an intoxicating mixture of ecstasy, joy, pride, shock, horror, resignation and shattered expectations as he recounts his memories of following a mediocre lower league football club in their fight for survival against almost insurmountable odds. As for Gus, he was a Janner, a nickname for all those unlucky enough to be born and (in)bred in Plymouth. He was a popular rabbit puppet who appeared on local television for almost thirty years and helped celebrate children’s birthdays by doing a series of on-air bunny hops and winks. That all sounds pretty harmless and uncontentious to me but unfortunately Gus was also a rabid Plymouth Argyle supporter and would appear on-screen proudly wearing a green and white Argyle scarf whenever they had a whiff of success – pure provocation and something that used to infuriate young Simon as a died in the wool Exeter fan who took particular delight in his club’s rare victories over their local rivals. Fans of every other Football League team will identify with the exploits and adventures recounted in this book. Taking a total of ten supporters to midweek games up North in the depths of Winter, travelling away with no hint of expectation when actually scoring a goal, or at least winning a corner, was the most one could hope for. Losing miserably and spinelessly to the like of Warrington in the FA Cup with the further embarrassment of seeing your team’s myriad shortcomings transmitted to the entire nation through the live television coverage on BBC. The sense of utter frustration when you just know that your team will let you down whenever it really matters, but, never mind, you will still be there for the next game or the following season with the slate wiped clean knowing full well that further embarrassments and disappointments await you. Carter writes well and concisely with short, sharp, staccato, tight sentences and he has a keen eye for a headline and an article that grabs your attention in the opening paragraph, draws you in and then never lets go. He is a fanatic without being an anorak or statto and non-Exeter City fans will be able to stay with the book without too much trouble as it deals with a multitude of themes and subjects that will resonate with every football fan without going into mind numbing detail of obscure games, players and events from long ago which would have far more limited appeal. Carter does celebrate local heroes such as Tony Kellow, a squat goalhanger who, back in the day, often put Brentford to the sword, the late and much lamented Adam Stansfield, goal machine Darran Rowbotham and Peter Hatch, still living in Exeter thirty-five years after spearheading a massive four goal giant killing of Newcastle United, who Carter interviews and then writes about with much poignancy and pride. Sometimes it is good to actually meet your heroes when they turn out to be even better men in the flesh than in the imagination of a young boy. Supporting a no-hoper is all about patience and tolerance and being able to take pleasure in small mercies and then relishing and celebrating the rare triumphs and achievements when they do come along and there is much here about the glory of winning the Fourth Division Championship in 1990 and gaining promotion back to the Football League in 2008 through the dreaded playoffs. Who can begrudge him the opportunity to play the likes of Manchester United and Liverpool in the FA Cup and achieve meritorious draws against both Premier League giants as well as earning enough money from the ties to help keep the club afloat? Brentford fans will enjoy his account of the quite ridiculous 1982/83 season which saw Exeter barely escape relegation despite scoring eighty-one goals – generally enough to ensure a promotion bid, but Exeter also inconceivably found a way to concede a staggering one hundred and four times and their forty-six matches saw an incredible one hundred and eighty-five goals scored, or four goals in every match. 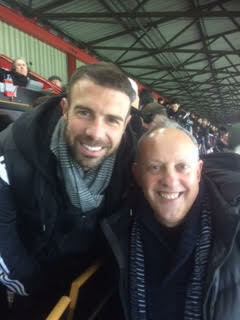 Eight of those goals came in that unforgettable game which Brentford won by seven goals to one. Carter witnessed this humiliation yet he was back, undaunted, bright eyed and bushy tailed for the next game which saw a massive improvement as his heroes only lost by five goals to one to Orient! Football is also about friends and companionship and there are many amusing tales of derring-do as Simon and his mates travel the country more in hope than expectation and somehow manage to get back unscathed to their South Western outpost. Bizarrely he also comes across the likes of Brad Pitt, Freddie Starr and Uri Geller in the course of his adventures. There is gallows humour in abundance and the book is an easy, fulfilling and amusing read but Simon’s account of his unrequited passion and love affair also has the power to stir the emotions and move you at the same time. This is a book that should not be missed and it is highly recommended for supporters of any football club from Aldershot to Yeovil – apart of course from Plymouth Argyle. GUS HONEYBUN, YOU BOYS TOOK ONE HELL OF A BEATING BY SIMON CARTER AND PUBLISHED BY PITCH PUBLISHING. AVAILABLE ON AMAZON FOR £12.99. Please forgive me if I blow my own trumpet a little bit today. I woke up yesterday to a lovely and totally unexpected surprise – a long and detailed review of Ahead Of The Game from Rob Langham, the co-founder of the quite excellent Football League website and blog, The Two Unfortunates. This is a remarkable book from Greville Waterman. Weighing in at a colossal 400 pages, it’s a sumptuous chronicle of one of the best seasons in the history of Brentford Football Club, a warts and all expose of club’s march to the Championship play-offs which, although predicted (kind of) in these quarters, obviously came as a surprise to the nation’s press and the bulk of their opponents, such was the inability to cope with the Bees’ fluid passing style and shrewd tactics in 2014/15. So how did Greville Waterman, an autogenic therapist, find the time to compile such a tome? The answer is incrementally. By piecing together contributions to his excellent blog, BFCTalk, Waterman has opted to republish the whole set of exhaustive posts within the covers of a print edition, supplemented by the odd new entry. It’s a format which various blogs have followed before, most notably the pioneering sites Pitch Invasion and In Bed With Maradona and serves a useful purpose. Few of us read every word a website produces so to have them gathered under one roof is a logical summarising statement. IPads notwithstanding, there is also the ease of digestion that a hard copy brings. Of course there are disadvantages – the immediacy of online commentary as a medium is hard to beat and one becomes used to immediate feedback on one’s work via twitter, comments sections and other social media. That’s less the case with a book where the pedestrian process of printing and distribution and the difficulty punters have in immediately responding can leave one wondering what people think of your writing. Hence, a club based project for the specialist reader will rely on distribution through channels such as the club shop and the community of fans – Brentford are one of the best represented among football league clubs in this respect, the excellent Beesotted sitting alongside Waterman’s blog as a home for considered, thoughtful opinion. Of course no discussion of Brentford in 2014-5 can avoid the unceremonious parting of the ways with manager Mark Warburton in the season’s run in. Avoiding the inclination to side with club policy, Stalinist style, Waterman takes care to provide opposing points of view and this is the correct decision given that none of us know the real story behind the ex-city trader’s departure and the unusual way in which it was handled. On the face of it, Warburton, now shooting turkeys in charge of Glasgow Rangers, seemed the perfect fit for Matthew Benham’s stat attack. With a background forged among metrics and variables, the fit was obviously a good one and it seems that less than 100% control over recruitment was the sticking point. Waterman correctly predicts the emergence this season of an ‘I told you so bandwagon’ and no sooner was 2015-6 underway than that particular vehicle could be seen riding into town. But Brentford have stabilised quite well under Lee Carsley and have now managed to tempt Dean Smith away from Walsall. Only a fool would write them off just yet. Meanwhile, Waterman continues to type away and his musings provide much of interest, not just to Brentford fans, but to supporters of all clubs in the division, not to mention football as a whole. That comes on the back of 50 years supporting the club through thick and, let’s face it, mainly thin. So, the enthusiasm that pours from the page at such a stunningly successful season for the Bees is unsurprising; leaving anyone with an ounce of emotion warm inside. I was totally bowled over by Rob’s kind words and for once almost find myself struggling to know what to say in response – a rare feeling as I am sure you all fully realise. Recognition from an acclaimed football writer like Rob – even if he is a Reading fan – makes it all worthwhile as does the realisation that your words do matter as they are having an effect upon somebody and that readers are really enjoying and identifying with what you have written. I love writing this blog and I am giving you all an advance warning that I am already well over one hundred and twenty-five thousand words into next year’s book with the season still less than halfway over and with much more activity anticipated at Griffin Park over the coming months. More grist to my mill I am sure! Even though there is so much fertile material about the club and everybody associated with it that just begs to be written about, discussed and analysed, sometimes it is hard to find the time, energy and motivation to get it all down on paper, so to receive a boost like I did yesterday from Rob makes it all totally worthwhile. Thank you once more and now – back to the grindstone! Former Bees legend – to me anyway – Richard Lee will be joining me in the BFC Superstore at 1.30pm this Saturday before the Preston North End match to sign copies of Ahead Of The Game. Richard is featured heavily in the book and also wrote a brilliant review of the season which outlined exactly what is was like to be in the dressing room last season as well as his carefully considered viewpoint on both Matthew Benham and Mark Warburton. Even if you do not want to read my stuff, Richard’s chapter is well worth the price of the book by itself! 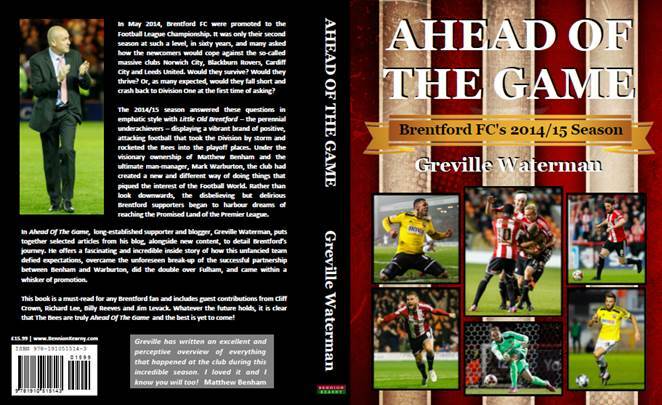 It would be great to meet fellow Brentford fans who hopefully enjoy my blog and perhaps those who have not yet bought a copy of Ahead Of The Game might now reconsider and come along on Saturday. So far I have sold around 500 copies which is pretty good for a book on Brentford FC but hopefully with the help of all of you, and maybe a pre-Christmas rush too, we can at least double that figure which would mean that I should then be able to get another book published at the beginning of next season – if that’s what you all want! Richard and I look forward to seeing you this Saturday!